Also available in Blue color here! 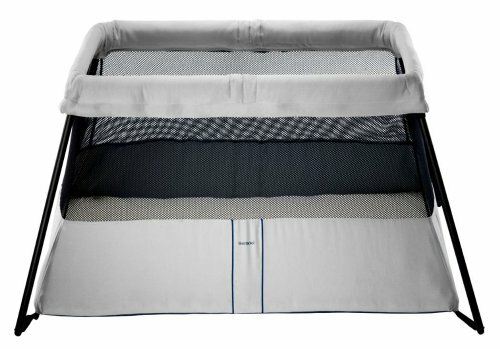 Introducing the practical travel crib that sets up easily with a single movement in a matter of seconds. Weighing less than 11 pounds including the case, the BabyBjörn travel crib light is easy to carry and transport, making it the perfect crib to take with you on trips. Soft fabric makes it snug and cozy for your child. Both the bed fabric and waterproof mattress cover can be machine-washed. When not in use, the BabyBjörn travel crib light folds up compactly in its case, making it as convenient to carry as an ordinary bag or suitcase. Traveling overnight with little ones has never been more pleasant, thanks to the convenient, efficient BABYBJÖRN Travel Crib Light (Silver). Lightweight and portable, the crib is the ideal solution for making your baby feel comfortable and safe when sleeping away from home. It sets up in seconds and features a plush, cozy mattress and a sturdy base that doesn't wobble. Who: Parents, grandparents, and childcare providers. What: A portable crib you can use in any room, or take on trips. Where: Babysitter's house, airports, and hotels. The lightweight Travel Crib Light is a breeze to take down and carry around when traveling. The lightweight construction of the Travel Crib Light makes traveling hassle-free for parents. Weighing less than 11 pounds (including the case), the crib is easy for any adult to carry around the house, pack into a car, or carry through an airport. Last updated: April 20, 2019 at 11:20 EST. Pricing information is provided by the listed merchants. GoSale.com is not responsible for the accuracy of pricing information, product information or the images provided. Product prices and availability is subject to change. Any price and availability information displayed on amazon.com or other merchants at the time of purchase will apply to the purchase of the product. As always, be sure to visit the merchant's site to review and verify product information, price, and shipping costs. GoSale.com is not responsible for the content and opinions contained in customer submitted reviews.